Silargan pots are suitable for all stove types, including induction. Bottom with pulled through steel core and fast heat conduction and perfect heat storage for energy-efficient cooking. Material: Silargan - dishwasher safe functional ceramics. Easy to clean non-porous closed surface, oven safe, cut and scratch resistant and tasteless. Nickel-free inner and outer ceramic Silargan surface. Made in Germany - Premium quality, produced in-house in Germany. 30-Year warranty for the inner and outer ceramic Silargan surface with intended use. Clear harmonic shape. The milk pan is by far the most recognisable of pans: it is small, deep and has a long handle sticking out from the side or pointing downwards. A milk pan is ideal for heating milk and hot chocolate or mixing puddings and glazes. At 12 centimetres deep, it is also perfect for boiling eggs: the boiling water bubbles without splashing. The inside scale makes it easier to measure liquids and the wide pouring rim ensures drip-free pouring. Pan holders becomes superfluous, as the practical handle stays cool when cooking. WMF milk pans come in straight or bulbous forms, in polished or matte Cromargan® stainless steel as well as with a triple-layer non-stick coating inside. Thanks to their TransTherm® universal base, they are suitable for use on all hobs, including induction, quickly absorb heat and distribute it evenly. 14 centimetres in diameter, the pans hold around 1.8 litres of liquid and can be cleaned in the dishwasher. The Silit Modesto cookware series combines outstanding functionality with a clear and harmonious design. The black pots and pans in various sizes are suitable for use on all types of hob, while the extra-strong, energy-saving base conducts the heat directly up to the rim, where it is retained for a long time. The see-through lid made from heat-resistant glass sits firmly in the pan, allowing vegetables, fish and meat to be gently cooked in only a small amount of oil or water. The flared pouring rim enables easy pouring and draining of liquids. The high-quality handles made from special plastic are heat-resistant and can thus be handled safely without a pan holder, and thanks to flame-retardant stainless steel, the cookware can also be used on gas hobs. The dishwasher-safe Modesto collection includes a deep and shallow casserole pan with lid (16, 20 or 24 centimetres in diameter), a milk pan (14 centimetres in diameter) as well as a saucepan without lid (16 centimetres in diameter). Thanks to WMF milk need never boil over again! Milk boiling over is the bane of every chef's life, as it creates a lot of extra work in cleaning it up. A WMF milk pot means you can gently warm your milk up without running the risk of it boiling over! Milk boiling over? No more with our WMF milk pots! Whatever unexpected difficulties may arise from warming up milk, every chef knows all too well that milk can boil over at any moment as soon as he or she turns his back. A special milk pot is an excellent addition to our cookware set to make sure this doesn't happen. Milk pots are tall and narrow.  The models available in the WMF online shop always have a diameter of 14 cm and are around 12 cm high, which gives a volume of 1.7 to 1.8 litres. Milk tends to climb up the pot when it is not stirred while heated and it reaches the boiling point. The high edges stop milk from boiling over, as least for some time. All our milk pots have an inside scale to measure liquid so that you can pour milk straight into the pot without losing track of amounts. Another practical feature of the milk pot is the specially shaped edge which makes it easier to pour milk into the cup. Alternatively, some models are fitted with a tapered spout so that nothing is spilt when pouring. The elongated handle also helps, and on the milk pot is typically bent downwards. The handle is always hollow, so it does not heat up when the milk is being boiled. Even though it is called a milk pot, of course it can do a lot more. You can use it to heat cocoa or hot chocolate, or to stir pudding, cream or a cake glaze without anything getting burnt or boiling over. A milk pot has its uses even when cooking eggs, since thanks to the high edges you can let the cooking water bubble away without it splashing. All WMF milk pots are made from Cromargan® stainless steel 18/10, which is particularly easy to clean and hygienic, and are suitable for induction hobs. Explore our assortment of products – you will find milk pots in a modern or classic design to match our Diadem Plus, ProfiSelect and Trend collections. The right lid for every pot! Every pot comes with a matching lid. Our pots are fitted with high-tech lids which also have special functions to help you cook. WMF pot lids have it covered. But which lid is the right one? The lids in our collections are not only made to physically fit the pot, but they are made to look right with it as well. WMF metal lids combine safety with the high standards that the professional chef as well as the enthusiastic amateur have come to expect. The lids are in most cases fitted with hollow handles. The thermal break means the handle stays comfortable to touch when the lid is on the pot sitting on the hotplate. The lids are made from our tried-and-tested Cromargan® stainless steel 18/10 and it should go without saying that they are dishwasher safe and suitable for induction hobs. We offer lids both in matte and polished designs, meaning that you can always find the lid that goes best with your pot. Our lids are completely watertight. Traditional lids are in most cases made to be non-insertable. The heavy design of the lid can also reliably close the pot without hermetically sealing it. A non-insertable lid doesn't have a seal, unlike for example a pressure cooker lid, but the specially designed edge ensures a perfect fit. A number of lids have a vent hole to stop an unwanted vacuum from building up inside the pot. Spare lids – making sure you always have the size you need! Our lids may be robust, but no item of cookware is accident-proof. If you want to replace a lid for one of our pots then we recommend measuring the diameter of the pot just to be sure before placing your order with us. Measurements should be taken at the top inside edge if you want to be sure you're ordering the right one. Because our pots and frying pans are meticulously designed to provide a perfect fit, the measurements don't need to be exact. We sell pots in diameters from 12 to 32 cm, and you will be able to find a matching lid for any pot in our product range, whether you need a replacement or just want a spare. Pots and lids come together as a perfectly harmonised unit both in our cookware sets and when bought as individual items. Choose pots with lids from our collections that aren't just functional but aesthetically pleasing as well. If you want to keep an eye on your cooking at all times then we recommend our collection of lids made from heat-resistant high-quality glass.